Cold weather hiking presents new challenges and thrills for those familiar with summer hikes, or to new hikers in general. It also calls for different gear. Preparing for a cold hike means taking unique situations like heavy snow, less natural light, and using more body energy into consideration. As such, preparing correctly means acquiring the right resources. Cold weather hiking gear is a world of its own from fashion to footwear and even food supplies! Layers on a cold weather hike keep you warm while providing the ultimate comfort. Layers are a practical approach to combating the elements. They can serve as insulation, protection, or both, providing the ultimate comfort in even the most extreme conditions. The best way to layer is to think in threes: the base layer, insulating layer, and shell layer. Each has a specific task to perform whether it be managing moisture, protection from the cold, or fighting off the elements. Moisture management is a crucial aspect of the base layer. The best cold weather hiking gear on this level serves to regulate body temperature. It grabs perspiration from your skin, keeping you dry throughout your hike. Look for shirts made of merino wool or synthetic fabrics. These materials take your sweat and pull it to the outer layer of the clothing you are wearing, rather than absorbing it. This protects you from walking around damp as you sweat, which can lead to hypothermia. Look for base layers meant to avoid perspiration in cold conditions, like thermal underwear. Insulation is key for cold weather hikes. This layer keeps your natural heat close to the body even after it is released. Fabrics with the right warmth-to-weight ratio will help determine the amount of insulation you need. Most products, like fleece tops and sweaters, range from lightweight, mid-weight, and expedition-weight activity. Not all products are made to insulate when wet, though. Make sure your choice will dry quickly and is suitable for various levels of activity. The shell layer is meant to protect from wind, rain, or snow – all of which can be expected on a cold weather hike. It also serves as a ventilation point to release perspiration. This balances the amount of body heat preserved to stay warm with the sweat you need to get rid of. It avoids sweat getting trapped on your skin over time. Shells come in five basic categories. The right cold weather hiking gear at this step depends on the length of your journey and extremity of the conditions. Insulated shells are best for consistently cold conditions, but they may get too hot for hikes varying in temperatures throughout the day. Waterproof, breathable shells offer the most protection while still allowing maximum mobility and wear. However, these are the most expensive. For a cheaper alternative, soft shells provide the most amount of breath-ability while still offering an insulated option for cold weather hiking gear. Hiking in the wet, cold snow is much different than hiking on the soft trails of summer. You need the proper footwear to ensure lasting comfort in boots made to take on cold conditions. 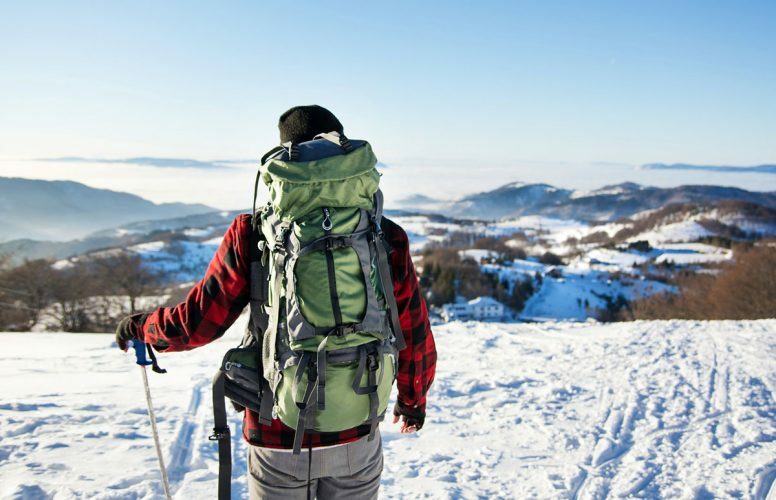 The top things to consider about cold weather hiking gear in terms of footwear are height, water resistance, and types of insulation. A tall boot offers the benefit of keeping your ankles warmer and better protects the inside of your shoe from snow. However, these are much heavier and can wear on the body (and your energy) on long hikes. The ideal height is about 7 to 8 inches. Water resistance is important on the inside and outside of the shoe. The best cold weather boots have an inner lining to insulate and allow the release of sweat vapor. The outer layer should have an added leather upper or rubber shell. The leather upper is treated to repel water and the rubber shell adds extra protection on the bottom of the shoe. Insulation comes in many different forms – over 9 different standards! The most important ones to pay attention to are Zylex, wool felt, and cuffs. Zylex is a popular liner in many winter boots able to efficiently wick off moisture and retain heat. Wool felt is an age-old remedy to manage sweat anywhere on the body, and it helps keep a thick seal on heat around the foot. Cuffs are the extreme cold weather hiking gear option. They protect the calf from discomfort and cold conditions by creating a ring around the top of the boot in order to catch and avert snow from the foot. Once your clothes are covered, there are other tools and resources to include in your cold weather hiking gear collection. Consider the best food, safety, and emergency options. Winter hikes can use anywhere from 2,000 to 3,000 calories over what you normally eat. No wonder most avid hikers recommend taking twice the amount you think you need! The best snacks and protein bars will come with the right amount of fats to utilize your carbohydrates. Carbs are the best source of readily available quick energy, but eating just carbs can cause a sugar crash. Fats help to prevent a crash because they take longer to break down and thus offer a source of long-term energy. Basic safety essentials on any hike include a first aid kit and a survival blanket. However, extreme conditions on a cold weather hike call for the proper safety cold weather hiking gear. Always set out with an emergency shelter, waterproof mat, fire making kit, and a fully-charged mobile phone, just in case. Be certain of the routes you will take and have detours in mind in the event of weather changes (like snow melting or loss of daylight). Another popular tip is to leave a copy of your route with someone. Winter hiking conditions are not something to take lightly. New and veteran hikers alike should consider the level of activity they plan to take on as they plan their excursion. Careful planning affects clothing, food, and other gear choices to create the ultimate hiking experience. Have you tested your cold weather hiking gear yet? Tell us about your adventure in the comments below!